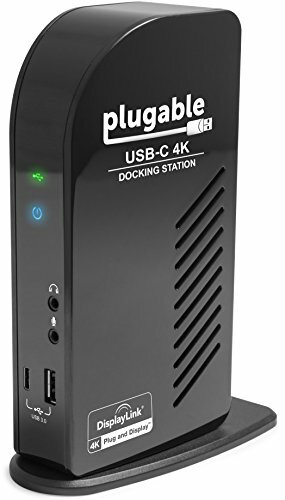 The Plugable UD-ULTCDL USB-C Docking Station provides up to three additional display outputs via a combination of USB-C DisplayPort Alternate Mode ("Alt Mode") and DisplayLink USB graphics. Up to 60W via USB-C Power Delivery ("PD") to charge your host computer, Gigabit Ethernet, audio, and expanded USB device connectivity. All through a single USB-C cable. Main HDMI port utilizes USB-C Alt Mode - a direct "pipeline" to the host graphics processor (GPU). Connected monitor will perform as if natively attached. The 2nd-3rd outputs are powered by DisplayLink DL-6950 which leverages the host GPU+CPU; these outputs are not recommended for gaming. The included power supply can charge compatible host systems with up to 60 watts of PD power. Charging speed is host dependent but behaves as if laptop/tablet were connected to it's stock charger. Windows drivers can also be installed by Windows Update (with existing Internet connection) or downloaded manually from plugable.com. DisplayLink graphics require Intel / AMD / NVIDIA GPU and driver. USB graphics require dual-core 2GHz+ CPU. Most current phones & tablets with USB-C ports do not support Alt Mode video output. ASMedia USB 3.1 controllers do not support Alt Mode at this time.